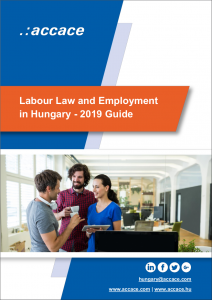 Hungarian legislation follows both European legislation and international trends in the field of labour law while showing characteristics inherent in national regulation. Employment relations in Hungary are governed by the Act I of 2012 on Labour Code and other labour law legislation, collective bargaining agreements and individual employment contracts. In the context of labour disputes in Hungary, courts generally protect employees’ rights by interpreting the provisions of the Labour Code, collective bargaining agreements and employment contracts often in favor of the employees. Overall, litigation trends reflect a decrease in the number of lawsuit initiated by blue-collar employees, while more and more white-collar employees, particularly executives and key-employees, are initiating labour disputes against their employers before courts in Hungary. Employment relationship in may be concluded for fixed term employment and for indefinite duration. The period of fixed-term employment in Hungary shall be determined according to the calendar or by other appropriate means. The duration of a fixed-term employment relationship may not exceed five years, including the duration of an extended relationship and that of another fixed-term employment relationship concluded within six months of the termination of the previous fixed-term employment relationship. A fixed-term employment relationship may be extended, or another fixed-term employment relationship may be concluded within six months from the time of termination of the previous one upon the employers legitimate interests. According to the intention of the parties, if they do not define the term of the employment relationship or they define it as “indefinite duration”, the contract is concluded for an indefinite duration. In Hungary, the conclusion of a written employment contract is a pre-requisite to enter into an employment relationship. It is the employer’s obligation to set forth any employment contract in writing. There are essential items in the contract, which has to be included. The parties of the employment contract must agree by all means on both the personal base wage and the position of the employee – these terms are essential under Hungarian labour law. It is not essential for the parties to set the place of work and the duration of the employment contract as well as the starting date of the employment relationship (lack of agreement on these issues will not affect the validity of the employment contract and relationship). If the parties fail to define the place of work, then the place where the employee regularly performs his work shall qualify as the place of work. The term of the employment relationship shall be defined in the employment contract. Failing this, the employment relationship is concluded for an indefinite duration. In the absence of an agreement to the contrary, all employment relations are concluded on general principle for full-time daily employment. Besides the essential and mandatory elements discussed above, the parties may set any other term they wish to provide for in the employment contract. The only thing the parties need to be aware of: such term may not be in violation of statutory labour law. As a general rule, the employment contract may derogate from the provisions of Part Two and from employment regulations to the benefit of the employee. In the case of executive employers, the parties are to agree on the terms of employment and there are less minimum terms to observe and apply of the Labour Code. In the Hungarian employment contract the parties may stipulate a probationary period of not more than three months from the date of commencement of the employment relationship. In the event that a shorter probationary period has been stipulated, the parties may extend the probationary period once. In either case, the duration of the probationary period may not exceed three months. Probationary period could be stipulated in case of fixed term employment and also in case of permanent employment. Stipulation of probationary period shall be included in the employment contract. Cases of termination of employment depend on the intention of the parties. An employment relationship in Hungary may be terminated in three ways: by mutual consent, by notice, by dismissal without notice. An employment relationship may be terminated by the employee and the employer by notice. If so agreed by the parties, the employment relationship may not be terminated by notice for a period of up to one year from the date of commencement of the employment relationship. with the employee’s ability or in connection with the employer’s operations. if maintaining the employment relationship is no longer possible due to unavoidable external reasons. in the case of women, while receiving treatment related to a human reproduction procedure, for up to six months from the beginning of such treatment. The period of notice is thirty days. of employment at the employer. By agreement of the parties the notice periods referred before may be extended by up to six months. The period of notice for the termination of a fixed-term employment relationship by notice may not go beyond the fixed term. The termination by mutual consent is not regulated by expressed Hungarian Labour Code provisions. Termination by mutual consent allows to the employer and employee to agree freely but in agreement with each other on the conditions of termination. otherwise engages in conduct that would render the employment relationship impossible. The right of termination without notice may be exercised within a period of fifteen days of gaining knowledge of the grounds. Therefore, in any case within not more than one year of the occurrence of such grounds, or in the event of a criminal offense up to the statute of limitation. If the right of termination without notice is exercised by a body, the date of gaining knowledge shall be the date when the body, acting as the body exercising employer’s rights, is informed regarding the grounds for termination without notice. In case of termination without notice, the justification is obligatory for the employer or the employee as well. The daily working time in full-time jobs is eight hours (regular daily working time). Work shall be scheduled for five days a week. The daily working time can be increased or reduced. Based on an agreement between the parties, the daily working time in full-time jobs may be increased to not more than twelve hours daily for employees: working in stand-by jobs, and who are relatives of the employer or the owner (extended daily working time). Employees in Hungary shall be entitled to have two rest days in a given week. In case of an irregular work schedule the weekly rest days may be scheduled irregularly as well. Instead of weekly rest days, employee shall be given at least forty-eight hours uninterrupted weekly rest period. In case of full-time employment, two hundred and fifty hours of overtime work is permitted in a calendar year. Working overtime shall be in writing, if requested by the employee. The amount of vested vacation time shall be twenty working days. Workers shall be entitled to extra vacation time from 1 to 10 days depend on the age of the employee according to the Labour Code. Parents also entitled to vacation after children (2 days after one, 4 days after two children, 7 days as a maximum per calendar year). Employees shall be entitled to fifteen working days of sick leave per calendar year for the duration of time during which the employee is incapacitated to work. Unpaid leave can be defined as quasi extraordinary vacation without pay, which is an opportunity, but also there are compulsory cases according to the Hungarian Labour Code. Employees shall convey the request for leave of absence without pay in writing, at least fifteen days in advance. In addition to the above unpaid leave also possible by mutual agreement of the employer and employee, however it is not regulated by the Hungarian Labour Code. The benefits can be systematised by many ways in Hungary, many kinds of benefit has catering purposes, purpose of welfare, or social purpose. It is also common to give cost contribution by the employer to the employee for example work clothes contribution. Part-time workers employed under employment contract in jobs for up to six hours a day shall work at times deemed necessary to best accommodate the function of their jobs. In this case the duration of working time banking may not exceed four months. Such an employment relationship is established by the fulfillment of the notification requirement of the employer. Not EU citizen shall only be employed in present employment relationship form in the frame of seasonal agricultural work. Number of employees in present form of employment is strictly regulated by the Labour Code. Present form of employment between employer and employee shall not exceed 120 days, even if the parties entered into more than one employment relationship. Present employment means when an employee is hired out by a temporary-work agency to a user enterprise for remunerated temporary work, provided there is an employment relationship between the worker and the temporary-work agency (placement). The duration of assignment may not exceed five years, including any period of extended assignment and re-assignment within a period of six months from the time of termination of his/her previous employment. Employers shall be entitled to temporarily reassign their employees to jobs and workplaces other than what is contained in the employment contracts, or to another employer. The duration of employment in present employment form may not exceed a total of forty-four working days or three hundred and fifty-two scheduled hours during a calendar year. This shall proportionately apply if the employment relationship commenced during the year, if it was entered into for a fixed term or in the case of irregular daily working time and part-time work. The employee affected shall be informed of the expected duration of work in derogation from the employment contract. In some cases, stated in the Hungarian Labour Code employee may not be transferred to work at another location without the employee’s consent.